If you are a purchaser in a chemical company, you may need purchase small quantities of chemical raw materials. But as it’s a small quantity, you have to pay a price much higher than that of those who buy ten times as much as you. As for factories that have poor capacity in cross-border trade, because of the lack of customers, they usually lower the price in order to sell more products, otherwise their products will be backlogged. If there is a platform that can bring them together, both the buyers and the sellers can benefit from it. Buyers can purchase at lower prices, sellers can sell more products. And group buying websites can create win-win opportunities. ChemBnB is a group buying brand under OKCHEM. It is launched to gather the buying crowd of the same chemical products and help the purchasers get stronger bargain power. By offering the chemicals from renowned suppliers, ChemBnB can help the group buyers get high quality products at lower price. With over 20 years experience in chemical industry, OKCHEM has a good relationship with top-level chemical factories in China. For factories, OKCHEM is a reliable partner to cooperate with and they are more likely to offer more competitive prices. 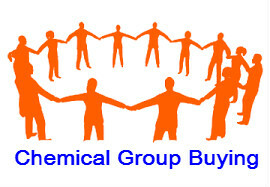 Through market research, OKCHEM selected qualified suppliers and products to organize chemical group buying activity. And OKCHEM will offer buyers one-stop purchasing service and will be responsible for delivery and quality assurance for the group buying products on ChemBnB. Now, there are two quality manufacturers selling their products on ChemBnB. Jianlong Biotechnology, the manufacturer of Xanthan Gum with FDA certificates, and Jinan Yuxing, the manufacturer of Titanium Dioxide with ISO9001 certificates. Both of the products are quite hot this year, and this is the first time they have been chosen for group buying. The buyers can really get big discounts on ChemBnB! Below are the guideline for you to understand and join in the buying crowd of either of the two products. Besides the big discounts, OKCHEM will also offer various incentives and rewards for the group buyers. And more quality products will be coming soon. Please visit www.chembnb.com for details and join the buying crowd to get stronger buying power!